This is not a fancy recipe. This is a “I need to use this lamb before it goes bad and I have a ton of zucchini from the garden and hey, look, there’s a can of coconut milk in the cupboard” type of recipe. It is not very pretty, either. 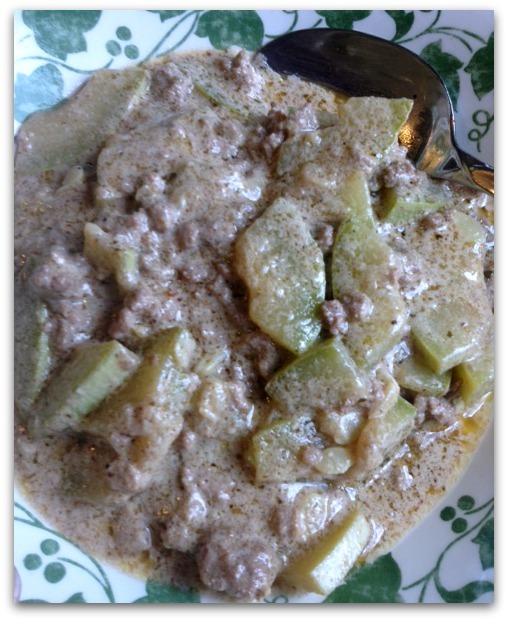 But it was filling and good and I didn’t have to throw out expensive lamb or waste the fruit of my garden! Heat a large skillet and add the coconut oil to melt. Cut the zucchini into sections about 1 inch wide and slice, adding to the skillet as you go. Mince the garlic and add to the skillet as well. Sautee for a minute or two, then add the lamb, breaking up with the spoon. There was a lot of liquid in the skillet at this point, so I had to stir a lot to get the lamb cooked. You could brown the lamb in a separate skillet and add to the zucchini when done, but I wanted this to be quick and easy, so I just worked through it. Add all spices and simmer for a few minutes to reduce the liquid a bit. Add coconut milk, bring to a boil, and then reduce to a simmer. Taste for seasoning. Allow the mixture to simmer for 10 minutes or so to thicken and blend seasonings. Taste again and adjust spices as needed. This turned out to be more a soup than a traditional curry, although it was thicker the next day. You could also add a bit of cayenne pepper if desired. Fresh herbs and spices are always better, but this was a quick lunch I threw together while working, so I used the dried for speed and ease. As I have been making the switch to low carb eating, I have had to change a lot about the way I eat and cook. For a while, it seemed like I was eating far too many of what I call component meals–meat, veg, salad, all separate. I like more complex flavors and dishes, and I like to make everything in one skillet, especially if I am cooking for only myself. This kind of recipe really helps me to feel like I am eating interesting food while staying on the low carb diet that seems to be helping me so much. Last week was the second week of school, and the first full week back. Plus, I had pottery class on Tuesday, Wednesday night I had an executive committee meeting for the Parents’ Club at the high school, a jump start conference for my 6th grader and crochet club, and Thursday was my birthday, for which we went out to dinner, then the girl had her first tumbling class on the other side of town. It was a busy, exhausting week. 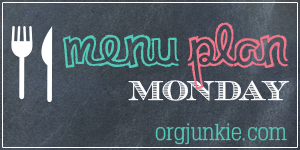 I did make a bit of a menu plan, but I never got around to finishing it and posting it here. We did manage to only eat out on my birthday, though, which I was very happy about–that was a planned night out after all. Then this weekend I spent a boatload of money. I went to Costco and bought a chest freezer! It really wasn’t that expensive, but I also did a big shop (gotta put some stuff in that freezer after all, 😉 ), and I filled my gas tank. I told the kids when I got home that we have lots of food, but once that is gone we will have to wait until next month to get any more, lol. I am ridiculously excited to have the freezer. There are so many things I can do with it! The girl is selling frozen pizzas and cookie dough to fund her choir trip, so it will be good to have the freezer space to store that stuff while she is arranging to deliver it to the people who ordered from her. But I can also come home from Costco without panicking that all the food won’t fit in the smallish freezer over my fridge! I can blanch veggies from the garden and freeze them for use all winter! I can do some freezer meals! Did I mention that my excitement is a bit ridiculous? This week I have plenty of food to choose from since I just went to Costco, so planning is easy in one way. I have plenty of food and I don’t have to get too creative in making meals. On the other hand, I tend to get overwhelmed by lots of choices. All the more reason to plan ahead, though–just think if I had to come home exhausted every day and then still decide what to make. Yuck. We would eat out, I know, and we can’t afford that after all the money I spend this weekend. With the Labor Day Holiday weekend, I am planning just a bit ahead this week. We are having family from out of town over on Sunday, so I want to make sure I am ready for them. You may notice that there is a lot of squash on that menu. I mean, it isn’t every night, but maybe it should be–I have so much squash from my garden still. I also made a delicious curried lamp stew with a giant zucchini today for lunch. Hooray, I thought, one less zucchini. Then I took the dog outside to do her business and found another big one needing to be picked, plus several more getting close. I wish the kids liked summer squashes more. I need some good low carb recipes that they would like. Anyone have recommendations? I feel the need to report my de-stashing progress now, while all the news is good. I am fairly certain that won’t last much longer, because I forgot to consider one thing: my birthday is August 22. How can I not buy myself yarn for my birthday? It is the day after payday, too! 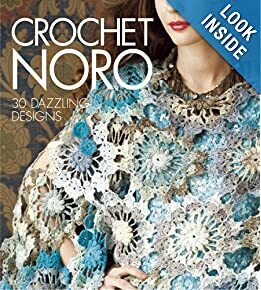 I only got one book, Crochet Noro. It has several beautiful projects, including one I would like to make my mother for Christmas, so I am happy to have it. I did look at the yarns I would need for some of the projects, but I really think it is better to do some planning before purchasing anyway. 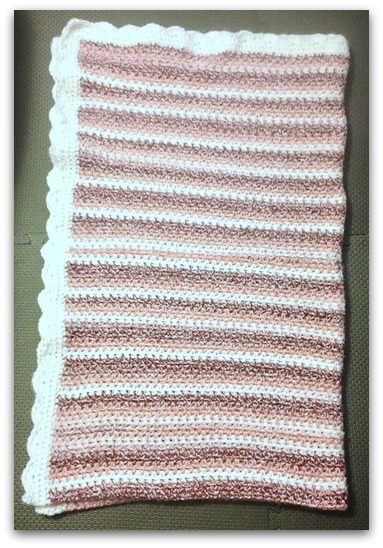 I have also done several rows on my Ribbon blanket. This is one of my long term WIPs–I started it last summer, I think. I am falling in love with it all over again, even though there is a nagging voice in my head talking about all the Christmas projects that need to be started. I don’t have an updated picture, but it is looking good. It is a great way to use up some of those partial skeins, too! In that spirit, I am planning to start making more granny squares. I want to make a granny blanket with a non-traditional color joining them, like hot pink, or turquoise, or maybe a spring green. Or yellow or purple or orange. Just not black or white–not that I don’t like the black or white grannies. I just want to do something different. How is everyone else doing on de-stashing? When I started my cousin’s going off to college blanket, I made the starting chain very loose. I hate working into those chains! 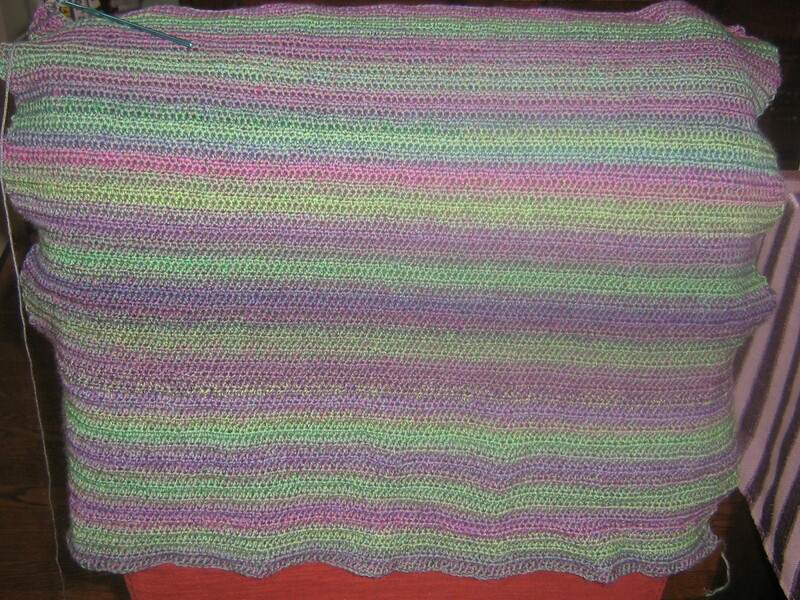 As I added height to the blanket, I ended up with about a 5 inch section at the bottom that was probably 4 – 6 inches wider than the rest of the blanket, though. If you look at the picture above, you can see that I have bunched up the bottom and it is still wider than the top. Of course, I didn’t notice this problem until I was well into the blanket–way too far to want to rip it out–so I decided this would be the perfect project to attempt acrylic yarn blocking. I hated the way it looked, but I was on a deadline, so I didn’t want to start over. 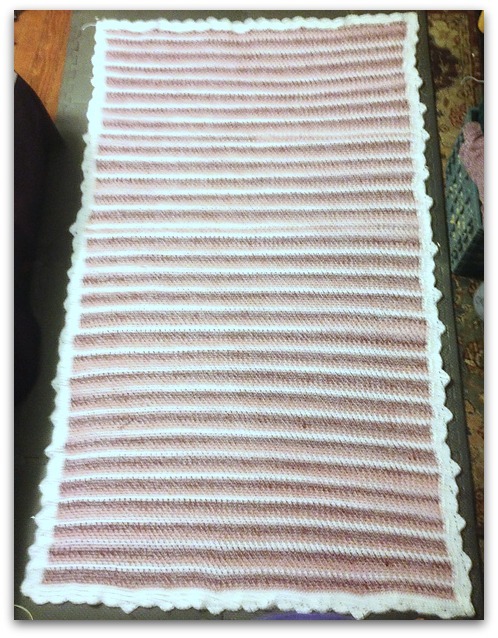 I completed the entire blanket, including the border last Friday night, Saturday morning I washed it alone in my washer, and Saturday afternoon I pinned it out on a gray mat in my bedroom. That was a more strenuous job than you’d think, because there was barely enough room to put the mat next to my bed, so I had to do a bit of contortionist bending to get the pins in place. I pinned it all, then rearranged the pins several times, getting the top stretched out and the bottom pushed in a bit without puckering. Once I got it pinned in place, I left the ceiling fan on and closed the door to keep the dog out and just left it there to dry in place. I crawled into bed from the foot of the bed that night because I wanted to leave it overnight just to be sure it was fully dry. Sunday morning, I unpinned it all and folded it up to see if it worked. I call it a success! It is not perfectly square when folded up, but it’s a heck of a lot closer to squared off than it was. When I folded it before, the bottom part would engulf the top and there would be 2 – 3 extra inches on both sides. I really hated how it looked. Now it looks like a normal blanket. And most importantly, when I delivered it to my cousin on Sunday afternoon, she loved it, too! This is actually the first major blocking that I have done. I believed what I read online at various places or heard in conversations–there is no point to blocking acrylic yarns, blocking is only for natural fibers. This turned out so well, though, I will be doing more blocking in the future. Do you do blocking? I would love to hear more experiences as I get more into this aspect of yarn crafting. Tuesday: First day of school! The kids are going to their dad’s and I am taking a pottery class, so this will be leftovers or a quick omelet for me. Thursday: Low carb Paella–another dish I just haven’t made happen yet. Saturday: I am leaving this one open–I think I am going to a friend’s house, but if not, I can make a plan when I get there. I started this project the day of my grandmother’s funeral. After the funeral lunch, many family members convened in my aunt’s condo to spend a bit more time with the out of town visitors and continue to support each other. Of course I had brought a crochet bag with me–the combination of the connection to my grandmother and the fact I knew I would be sitting chatting for quite some time required that I bring some stitching with me. 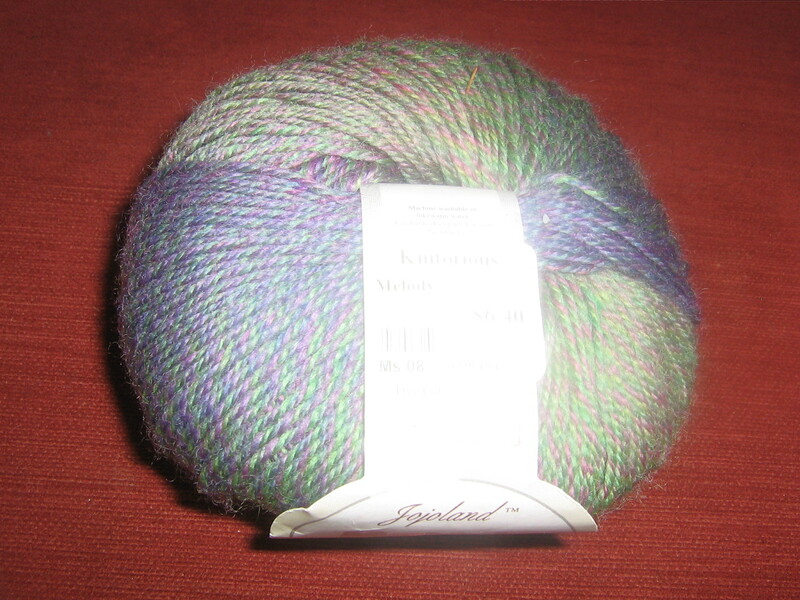 I bought the yarn at a local yarn shop because it was a combination of my two favorite colors, purple and green. I try not to buy yarn without some project in mind, but I loved this yarn so much, I couldn’t resist. I sat on my aunt’s couch, a bit numb, looking at the yarn. I wanted to make something beautiful, but I wasn’t sure what to make. I didn’t have a thought in mind beyond some kind of shawl. I started a chain, and I thought about doing a fancy ripple, but I couldn’t remember the pattern. Anyway, there were a lot of people talking, and I couldn’t keep a count in my head. I wanted something relaxing to do. So, I started making half double crochet stitches across. I thought it would make a nice border for whatever lacy pattern I decided to use for the main part of the wrap, but as I went, I found I liked it a lot as is. 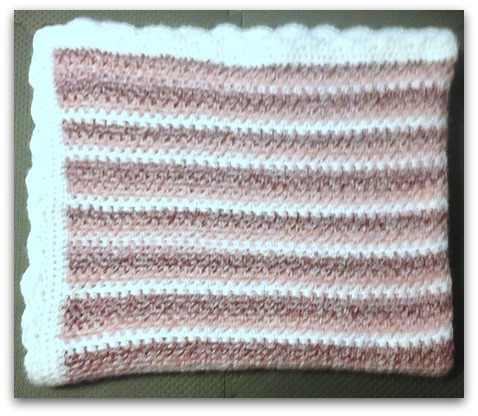 The yarn is so pretty, and the color striping added enough interest alone, I thought. Plus, I really like HDCs! That sounds odd to me, but it is my favorite stitch. So I have kept going. It is a nice pattern to carry around with me, because it doesn’t take a lot of space, and the lightweight yarn is cool to work with, even in the summer heat. Plus, it requires almost no thought, so I can keep my hands busy in all kinds of situations. It is time-consuming, though! 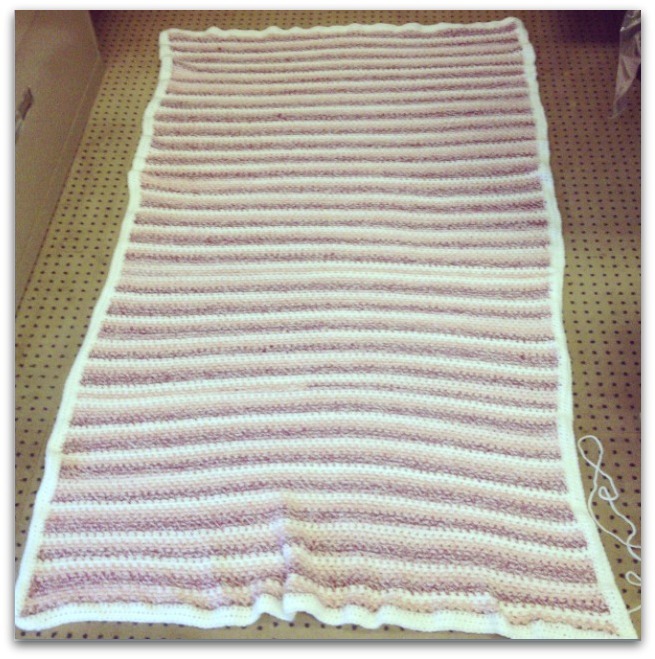 The rows go quickly–about 10 minutes a row–but you need a lot of rows to add length. The picture above is about 88 rows, or 14+ hours of work. I have a long way to go, too–I think this may be only about ⅕ of the way done. I picture a long stole that drapes around my arms and has plenty of length to throw over a shoulder. We’ll see how long it gets–it is very relaxing to make, so I enjoy working on it, but as it gets longer, I am going to be anxious to wear it, I know. It is so pretty already (in my humble opinion…). Last week was mostly successful on the menu. I actually made nearly everything on the menu, although not in order. I went out to eat one night and I didn’t get the paella made, but that is pretty good for a week with no kids, I think. This week I have hungry kids back with me, so I need to feed them here at home–I really miss the days when we could go out and I could buy them cheap kids’ meals. Or sometimes they would eat free! Now it costs a small fortune to take all three of us out. This is our last full week before school starts next Tuesday. We are already busy with friends and band camp and school prep, though. I am trying to get the house cleaned up (with help from the kids) to help the school year start off on an organized note, but no one wants to give up the last bits of end-of-summer laziness, ;). The beginning of school is expensive, too–supplies, pictures, yearbook order, renting a flute, and on and on–so the menu is extra important. I need to make sure we are not spending all of our money on eating out, tempting thought that may be. That said, we are eating out tonight for our last night at the Muny!